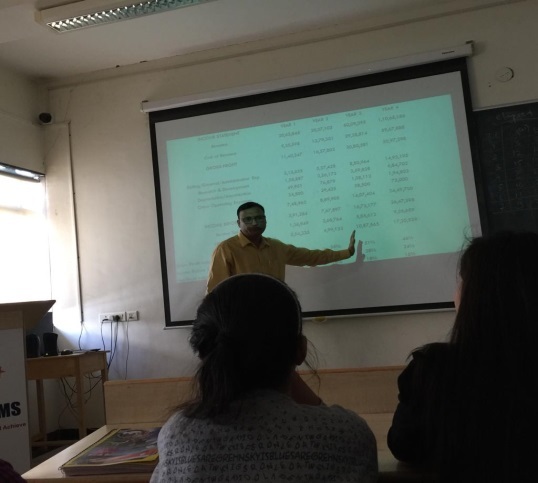 Mr. Sachin Jaju, Founder of Anupal Investments, used a Balance Sheet to explain how a financial analysis is done and used to evaluate economic trends, set financial policies, build long-term business plans and identify investment options. He also explained different ways in which data analysis can be done. He gave students an understanding of the strong fundamentals of our blue chip Indian companies and our robust economy. 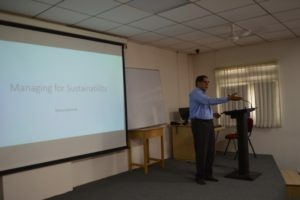 Mr. Niraj Mathur, having worked as Senior Assessor and Trainer at Lloyd’s Register Quality Assurance, Dubai and a much sought after Lead Auditor by national and international companies spoke about the modern buzz word ‘Sustainability’, UN Sustainability Development Goals (SDG), Principles of Sustainability and effective ways to manage sustainability. In his talk, he sensitized students about the alarming speed of industrialization, urbanization and societal and environmental issues brought about by such developments. Sustainable Development models are required to balance the three important pillars- Economics, Environment and Society. The talk was supported by a video on Sustainable Development Goals Agenda 2030 and measures such as Management System International Standards such as ISO 14001:2015 Environmental Management Systems and ISO 26000:2010 Guidance on Social Responsibility. He also conducted an activity to assess the understanding of sustainability among the students. CA Nagesh Jadhav [Laxmi Kumaran & Sridharan Attorneys Pune], was invited to speak on “Application of Input Tax Credit”. In his session he discussed points related to application of Input Tax Credit, ITC Process, Negative list for Input Tax Credit, Input Tax Credit Utilization, Input Tax Credit Reversal, Types of GST returns and their Due dates, late filing, late fee and interest. 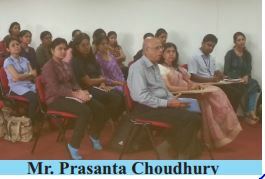 He further, enlightened the students on emerging opportunities in Finance sector in GST. 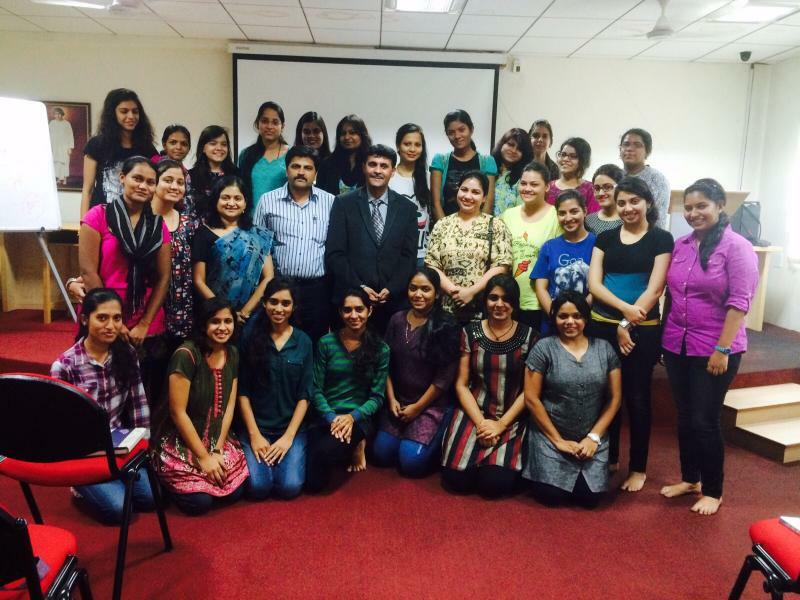 Ms. Awantika Bhardwaj, HR head at Tieto, Pune, was invited to speak on the topic – “Automations in HR “. She discussed how Automation is invading the HR space, and very soon everything that can be automated, will be automated. She justified her statement by giving examples of a restaurant in Nagoya, Japan where all systems are automated and chefs too are robots and a bank in Shanghai, China which is fully operated by robots. 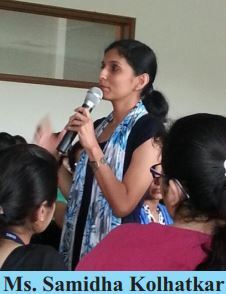 Responding to a query by a student ‘whether automation would eliminate workers’, Ms. Avantika stated that automation would change the nature of jobs and in fact create new ones such drone traffic controllers, human and technology integration specialists and human opportunity spotters. Hence, she advised students to strengthen their skills by taking specific courses in the area of their interests. 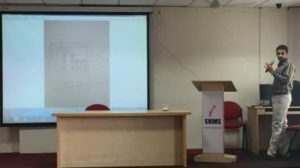 Mr. Jitendra Jaju, Manager, Preventive Maintainence at Leadec India Pvt Ltd was invited to talk on the above-mentioned topic and he led to the benefits of Preventive Maintainence in a very logical manner. He first explained the basics of it in the form of its meaning, types of Preventive Maintainence, the logical procedure of it and then went on to explain the benefits of it. 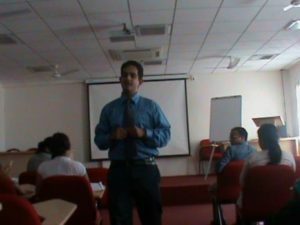 Parallelly, he gave practical examples from his experience to explain each point and the session ended with a query-solving session. A battle is already half won when you are well prepared for it! Hence, we decided to provide our HR students with an interface with the experts to draw from their experience and smoothly sail through the waters of corporate interviews. 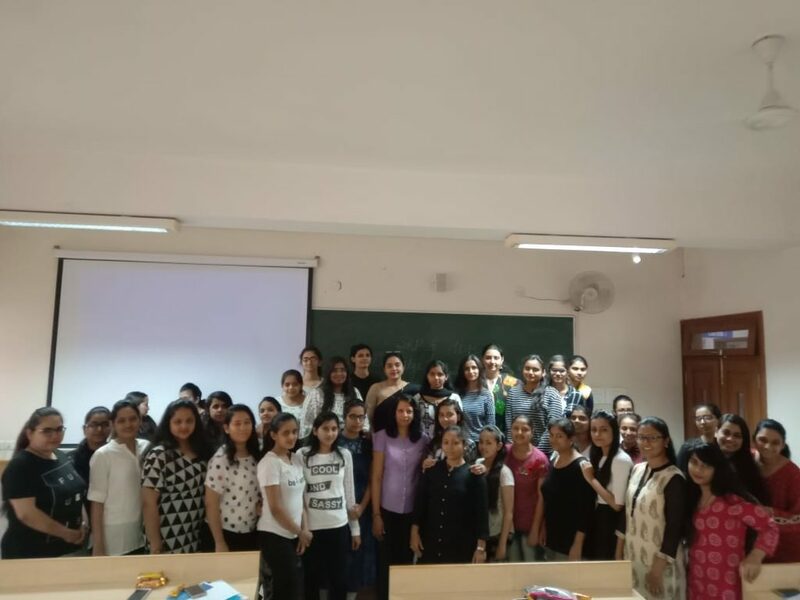 We invited Ms. Gurdayal Kaur Panjwani, our alumna and an HR analyst and Ms. Deepa Walimbe, an HR Admin, Talent Acquisition from Northern Trust Corporation to assist our students in preparation for the interview at a top-notch organization. By sharing their insights and experiences in the area of recruitment, they addressed the queries relating to a recruiter’s responsibilities, challenges encountered and how to overcome them, how to tap the sources of recruitment and certain special strategies that are used by them as top-notch recruiters. 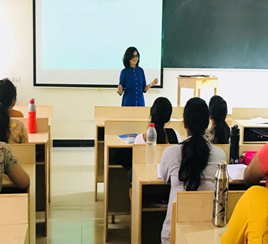 Ms. Prajakta Joshi, Sr.Executive Corporate HR, Thermax, Pune, discussed important rules, provisions in context of payment, working hours, overtime rates and legal requirements of keeping records of The Payment of Gratuity Act 1972, The Employees Provident Fund and Misc. Provisions Act 1952 and The Maternity Benefit Act 1961. She also detailed out legal problems and challenges faced by employers, employees in context of application and distribution of Provident Funds and Gratuity Payment’s through few cases. Towards the end of the session, Ms. Joshi highlighted aspects and rules for Prevention of Sexual Harassment at Workplace. Resource person: Mr. Abhinav Kumar, Vice President Barclays. Mr. Abhinav explained the importance and interrelationship of an organizational mission and vision with corporate strategy and its relationship with investment cost. He detailed out how an investment decision is viewed by the corporate board in terms of expected sales, market expansion and Return on Investment. He dwelled upon organizational structure and its relation with Costing and Capital model; how cost and revenue centers are aligned to organizational structure. He explained how costing model works in corporates, profit calculation of each SBU and evaluation of SBUs on parameters such as Net Profit, Net Marginal Profits and Total Assets/Equity. He also introduced the concepts of Risk Weighted Assets. While explaining costing models, he introduced Direct and Indirect costs and how business uses the information to drive operating cost efficiency and business initiatives. He summarised by explaining how these performance parameters are applied across various sectors/industries – Banking and Financial Services, Manufacturing, and E-Commerce. 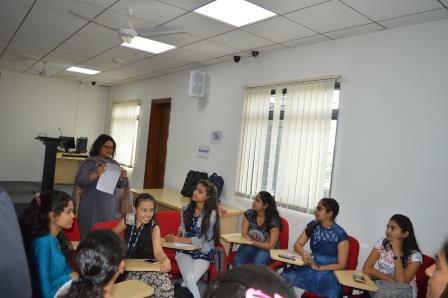 An interactive session on Decision Making was conducted by Ms. Kshtija Bhandari, Vice President, Northern Trust. She enlightened the students on how one should take decisions in good and bad situations. She shared tips to help take calculated risks in decisions. Ms.Bhandari also explained factors and circumstances which may affect one’s decision making abilities. 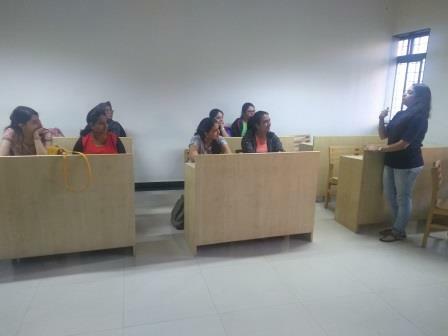 She conducted series of exercises in which students decision making abilities were assessed and challenged. The learning’s will go a long way in helping students become wise and effective managers/decision makers. Mr Dilip. 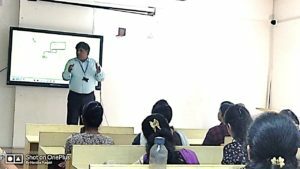 S.Bhonde, a charismatic, versatile, high profiled person with a vast experience spanning over 33 years was invited to conduct a workshop on “Critical Thinking”. He detailed out the theory of critical thinking and its application as given by Mr. Edward De Bono of Cognitive Research Trust (CoRT). 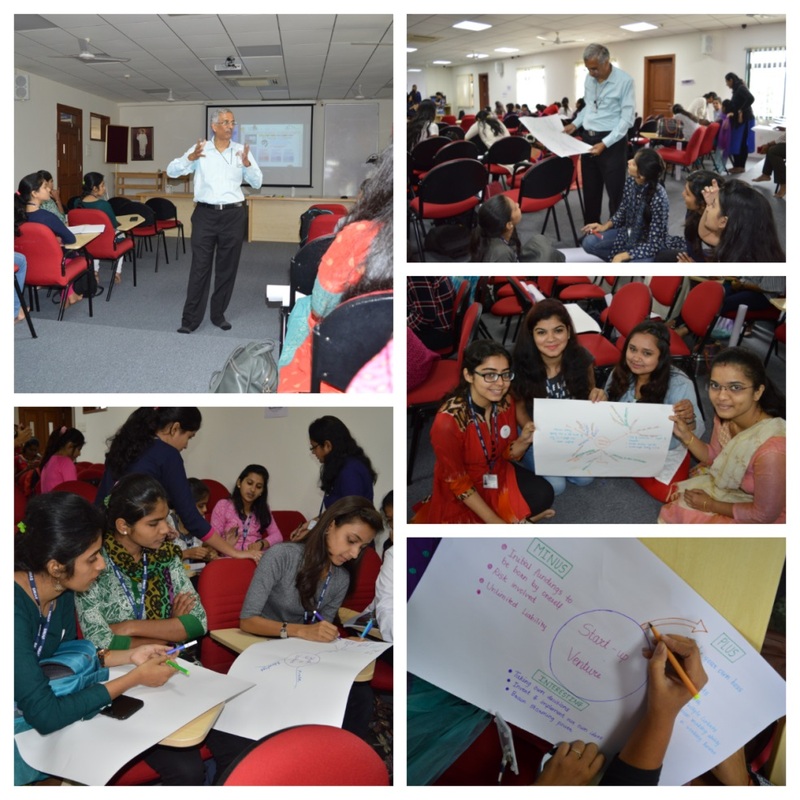 During the workshop he also conducted three activities on Mind Mapping based on the PMI (Plus, Minus, Interest) which is a directional tool for better establishment of goals. 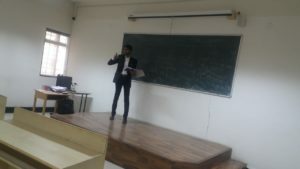 Mr. Bhonde also explained the concepts of “The Six Thinking Hats” Technique for “clarity in vision” through a very simple activity. Towards the end of the session he emphasized on the power of thinking and stated the two core values of thinking i.e. 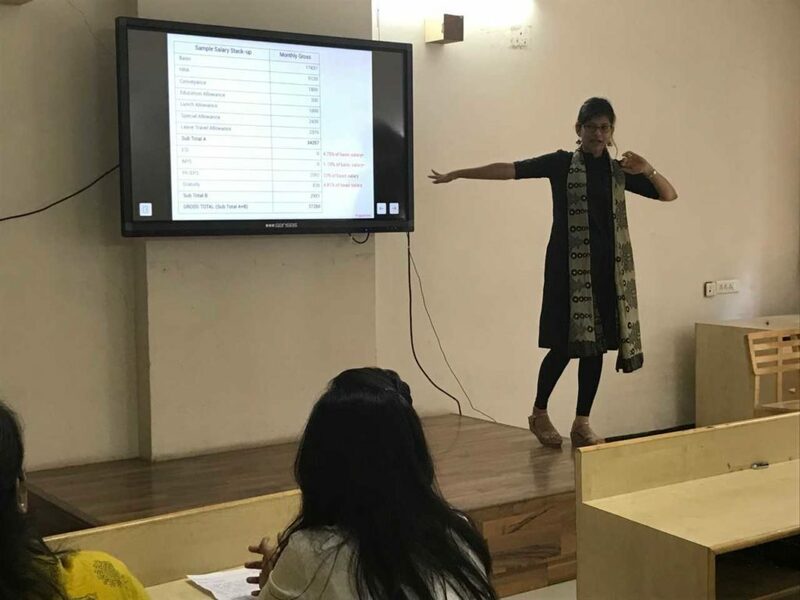 “Don’t get cheated, there is no free lunch” cautioned Ms. Shama Sarode, Financial Counselor of Disha Trust Pune, in her session on financial planning for youngsters. She advised on deciding short term and long – term financial goals, understanding fundamentals of financial planning, systematic investment plans, precautions to be taken while undertaking online banking transactions etc. Ms. Shama also explained the key concepts of investments and advised that one should take into consideration the rate of return, nature of risk involved, historical returns and tax benefits while making investments. An interesting Q-A session followed and we are positive the answers left the students financially more intelligent. 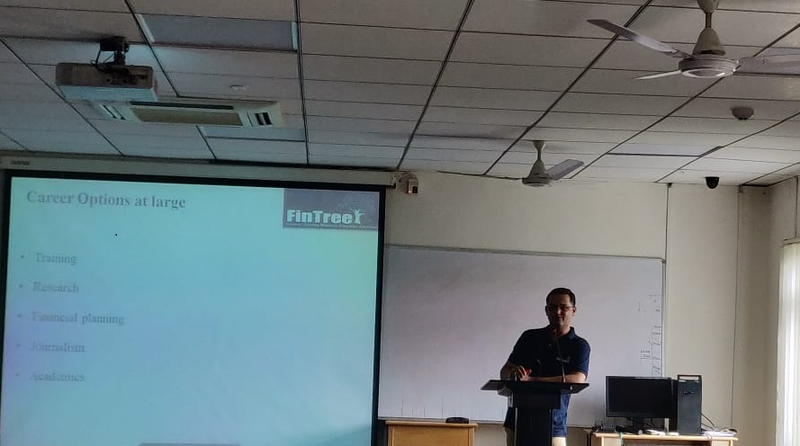 Mr. Rohan Kulkarni, the Channel Head, for Institutional Business at FinTree Pune, was invited to speak on ‘Emerging Careers in Financial Domain’. In his session, he discussed points related to, Accounting and Reporting, Fiduciary Services, Cash Flow Management, Investment Planning, Legal Advice, Trust and Estate Planning and Tax planning. 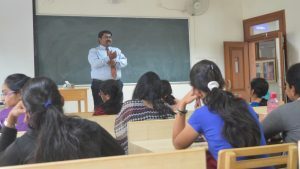 He further, enlightened the students on emerging roles in Finance sector like that of, Financial Planner, a Researcher, a Trainer, Academicians and Journalist. 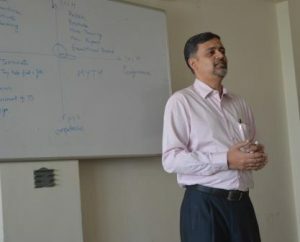 Mr. Shirish Dandekar, a dynamic person who has worked with IBM, PwC, L&T Infotech and SAIL as a HR manager and is now working as corporate trainer various MNCs in Pune, was invited to speak on ‘How knowledge of Organizational Behavior is being applied in the real world to improve Organizational effectiveness. In his session, he discussed points related to, Personality, attitude, job satisfaction, motivation and group dynamics and group conflicts. 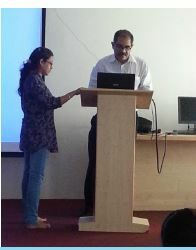 He further, enlightened the students on the diverse roles that HR managers are expected to play in the organizations. Towards the end of the session, he took up a couple of leadership and team building exercises for the students. 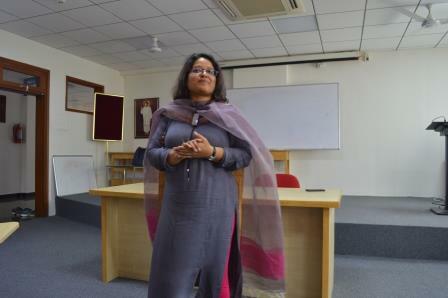 Ms. Manasi (HR Manager) from Thermax Limited, detailed out the evolution of Industrial Relations till date. She opined that today there is more of collaboration rather than combustion in employer – employee relations. Unions and Management broadly operate as a team rather than competitors. 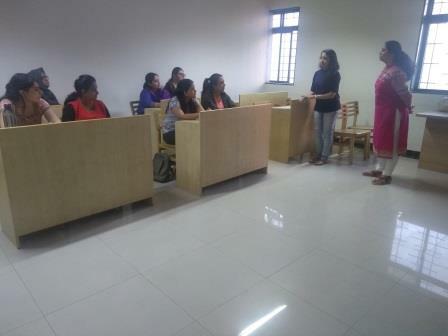 Ms. Purandare kept the students engrossed by conducting activities on breaking one’s comfort zone, listening skills and creativity – all of which are essential for maintaining healthy relations. Mr. Pradeep Bodke and Mr. Trishul Gorde both members of the Trade Union of Thermax Limited, Pune, highlighted the changing scenario covering the role, growth and opportunities for unions in industries. Mr. Bodke highlighted the evolution of 3 “Rs” for trade unions which are React, Reflect and Respond and their application. He explained how these 3Rs have changed the approach of unions towards the management and workers and led to peaceful and productive employee relationships. 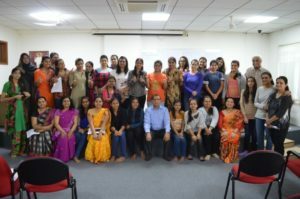 Mr. Ayush Agarwal, CEO and Co-founder of Senority, an RPG group company delivered a talk on ‘Performance Management in Retail sector’ on 16th October 2017. He explained the challenges faced by companies in the traditional retail sector especially in context of the necessity of using online platforms. He highlighted the fact that both online and offline sales platforms are needed by retail companiesand substantiated his stand by citing examples of Lifestyle, Urban Ladder and Myntra. Towards the end of his lecture he explained the ‘Sales Funnel’ model and how an organisation must make use of it to evaluate their marketing strategies because at the end, what matters most is sales figures. 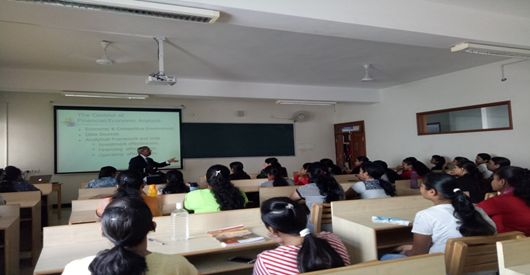 Mr. Sudhir Mateti, Deputy General Manager-HR –Syntel Telecom, Pune was invited to speak on the topic Human Capital Assessment – A Managerial Perspective.He explained that a well-defined job description forms a base for scientific selection and appraisal procedures. Very often assessors use Motivational Assessment to gauge whether the unfulfilled needs of appraisee are in alignment with goals of the organization. It is only when these two are aligned that high level of performance can be expected. He also explained that performance is dependent not just on competence and knowledge of how to do a job but also on the Willingness and Ability to do the job. Therefore, nowadays HR managers conduct cognitive and other psychological tests to assess knowledge and predict performance. Besides, Mr. Mateti shared some interesting examples along with role-play to explain biases in performance appraisal. In view of the complexity of businesses and increasing changes in industry, trade and commerce, costing is becoming very important. Managers who aren’t very involved with their company’s finances don’t usually do well. The ultimate goal is to make a profit by eliminating unnecessary costs. With the growing significance of cost management, CA Ashok Bhansali was invited to speak on the topic of Cost optimization. 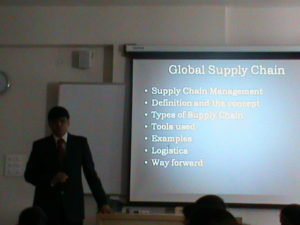 He introduced the topic by understanding how value is created in an organization. He spoke about the paradigm shift in cost optimization techniques. He went on to explain creative cost control techniques in the domain of cost avoidance, cost reduction and target costing. He shared his own experience of optimising manufacturing cost at Force Motors by using Just in time technique. He stressed on doing a cost – benefit analysis before adopting cost optimization techniques. Mr. Shivaji Daundkar, Chief Labour Officer from Pune Municipal Corporation, discussed important sections of The Payment of Wages Act 1936, The Minimum Wages Act 1948, and The Factories Act 1948 in context of wage payment, time of payment, working hours, weekly off, overtime rates and legal requirements of keeping records. He also detailed out legal problems and challenges faced by employers, employees and trade unions in context of application of the above laws. He advised students to set goals based on their potential and acquire and sharpen relevant skills, if, they wished to take up an HR Role. 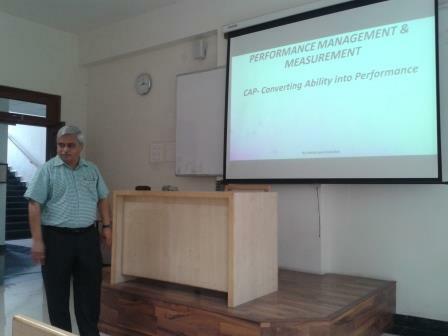 Mr. Akshay Deo, Sr. HR Manager-Carraro group, Pune was invited to speak on Role of Human Resource Managers in Industry. Mr. Deo informed students that entry level jobs in HR start with the designation of HR executive followed by Generalist and Specialist and that HR has to deal with people at all levels starting from their Entry to Exit. Typically, besides the usual functions of recruitments and training, an HR manager needs to creatively and innovatively design and undertake team building exercises, employee engagement programs, employee learning activities to help align employees to their jobs and prepare them for higher levels in the corporate world. To discharge functions effectively, he stressed that HR managers must necessarily have presence of mind while handling people and difficult situations. The session ended with Mr. Deo brilliantly fielding some interesting questions. Mr. Manoj Gursahani is ‎Director – Network & Strategy at KAM Analytics. He is a Professional Trainer & Speaker and has spoken at various National and International Forums and regularly conducts programs/workshops for Corporates &Leading Institutions. He is known as a Networking Guru & his passionate subject is “Art of Effective Networking and Communication.” He is currently authoring a book “Connecting the Dots” and Co-authoring another one on Artificial Intelligence. We live in a digital era and students cannot be out of sync with contemporary trends and skills such as Social Media and Digital Marketing. 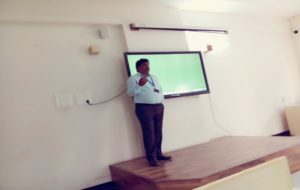 Mr. Gursahani emphasized the need for students to try and add more employable skills, learning to connect dots in the real world by becoming savvy on platforms as Twitter, LinkedIn et al. This is a networked world where students must learn how to increase their worth by expanding their own networks in the digital space. 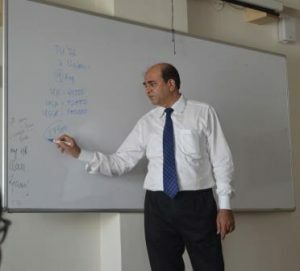 Mr. Gursahani supported his talk with real life illustrations of how the adage ‘shape up or ship out’ holds true. Mr. Viraj Khabiya, HR Manager-Bajaj Allianz was invited to speak on Industrial Legislation & its Practical Applications. He gave a bird’s eye view about the Factory’s Act, 1948, Minimum Wages Act, Industrial Disputes Act et al. Citing cases and examples from his work life, he brought out the need and importance of IR, its changing role and the importance of having a Trade Union in the industrial unit. An absence of the same can lead to serious IR issues. Simultaneously he brought out the ills of having multiple Trade Unions in the same organisation. This he said is counter productive and poses challenges during wage settlements and other labour disputes. B2B Marketing – Handling the Marketing Team at Armacell India Pvt Ltd.
Mr. Amit Mehendale, Head Marketing, Armacell India Pvt. Ltd. spoke about nuances of team handling such as managing team members with different competencies and performance levels and motivation. Drawing from his rich experience, the teacher exemplified the use of performance appraisal and monetary and non-monetary incentives in effective team management. He also brought forth the importance of developing cross-functional capabilities for advancement up the corporate ladder. 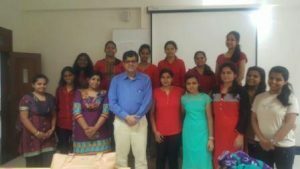 Advocate Shrikant Malegaonkar, practising at Pune Labour / Industrial Courts and also at the Bombay High Court and consultant explained the evolution of Labour Laws which is intertwined with the history of our nation. He also touched upon recent reforms proposed by Modi government especially in context of the Maternity Benefit Act. He also spoke about important sections of Acts like Industrial Dispute Act, Industrial Employment (Standing Orders) etc., which he stressed a student of MBA (HR) should be aware about. He also informed them that average membership in Trade Unions in India is way below membership in countries like UK. Whereas the membership in UK is 40000, in India the number is a mere 9. Adv. Malegaonkar’s talk was replete with cases he had handled in his rich career spanning 22 years. He answered legal queries of students in context of employment bonds, notice period, probation period and working hours etc. Mr. Rajesh Agrawal, partner in SRA & CO. gave a comprehensive talk on GST explaining the concept, impact on the tax structure, tax incidence, tax computation, tax payment, compliance, credit utilization, reporting and returns to be filed et al. GST he averred will lead to a complete overhaul of the current indirect tax system. He also explained about reverse charge mechanism and threshold limits applicable to GST. 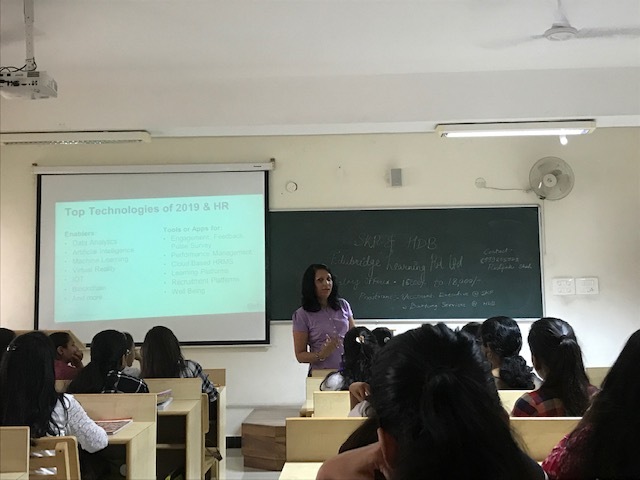 CA Ms. Shalini Sinha, CFO, Express Clinics Private Limited sensitized students about the growing importance and role of ERP in modern Finance Departments. 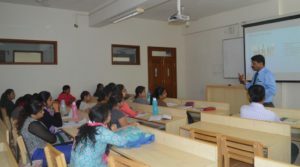 Students are usually all at sea regarding the real functions of a Finance Department, but CA Shalini’s talk helped students gain practical insights into the working of Finance Departments in context of Accounts Receivables, Accounts Payable, use of MIS for collections and consolidating accounting transactions of other departments. Mr. Anwar Tamboli, Branch Head, Nagras Rd, ICICI Bank Pune was invited to speak on ‘Retail Banking – Winning Strategies of ICICI Bank’. 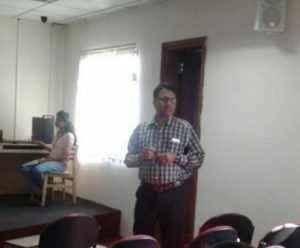 Apart from sharing winning strategies like using cutting edge technology to generate leads, customer segmentation, building long term relationships the speaker also shared various career options within banking like managing asset and liability side of Balance Sheet, treasury, operations and credit rating for loans etc . The talk was very well received by students. Mr. Shambhu Thakur, Director, Vito Therapeutics Pvt Ltd. stated that the Indian Pharmaceutical Sector IPM) accounts for approx.1.4% of the global pharmaceutical industry in value terms and 20% in the volume terms. The IPM is valued at Rs 860 bn for the year ending March 2016. The growth in 2016 stood at 12.6%. Owing to robust historical growth, many MNC companies have active presence in the Indian pharma space. The IPM is highly fragmented with about 24,000 players (330 in the organised sector). The top ten companies including domestic and MNC companies make up for more than a third of the market. The market is dominated majorly by branded generics, which constitutes nearly 70% of the overall market. Over the counter (OTC) medicines and patented drugs constitute 21% and 9% respectively. Mr. Shambhu Thakur emphasised on the use of Four P’s of Marketing to attain success in any business. -By the end of this financial year 2016-17, Vito Therapeutics Pvt Ltd intends to go global. -By the year 2025 Vito Therapeutics Pvt Ltd aspires to be amongst the top global Pharmaceutical Companies. 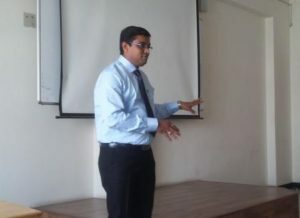 Mr Amit Kadam, Regional Manager(Marketing) ICICI Direct threw light on the marketing aspects of the banking industry. He began by giving a brief on ICICI and it’s various services. He said that banking is one of the fastest growing industry. 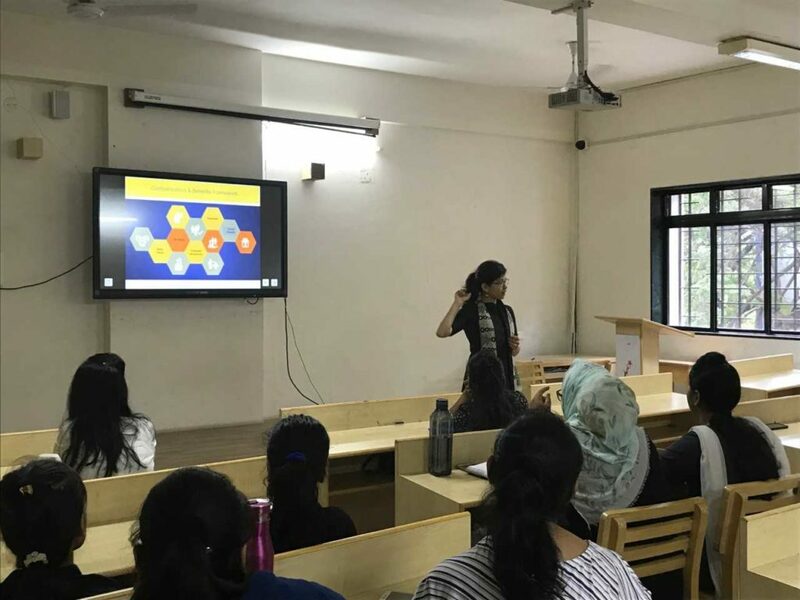 During this interactive session, He explained the students as to how ICICI carries its branding activities and how it’s branding strategy is different from FMCG products by giving an example of P&G. Mr Amit also spoke of Stockmind being one of their smart marketing move along with a CSR activity. He concluded by enlightening the class on the growing importance of digital marketing and it’s scope. “In this disruptive world of rapid digitalisation one can’t afford to be conservative with ones approach. Digital marketing is the future.” He encouraged the students to follow their passion and not trends. American Spraytech functions as contractor, innovator, formulator, and filler of aerosol spray products. It focuses on high end cosmetics and tropical pharma spray categories like hair-care, hair-styling as well as personal care. The company innovates and formulates products in-house in their R&D Labs. In the cosmetics category they are suppliers to L’Oreal and Revlon. They also supply several drug products to chain retail stores in the U.S like Wal-Mart, Target, CVS etc. -Map to Market ( Read the reviews of consumers and fill and cater to unfulfilled needs). Mr.Nitin Paliwal, DGM (Marketing) – Chettinad Cement covered a wide expanse of issues ranging from market outlook of the Cement Industry the world over with specific emphasis on India, Investments, Mergers & Acquisitions, Post Demonetization Scenario in context of the Cement Industry. He also spoke of the CSR initiatives of Chettinad Group in the industrial, infrastructural, educational and health care sectors. The Chettinad Group has had a long tradition of contribution towards social and community issues.Some of their prominent CSR activities are: Skill development programmes for the rural youth, Free medical camps, Setting up old age homes, Day care centers and such other facilities for senior citizens, Promoting preventive health care etc. Mr Mahantesh Sabarat, Dy Head- Equity Research at SBI Cap Securities spoke on myths about stock investment and provided valuable guidance on stocks for a novice. 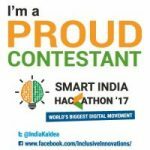 Mr. Khattar shared his experience of developing a cashless sanitary towels dispensing machine. 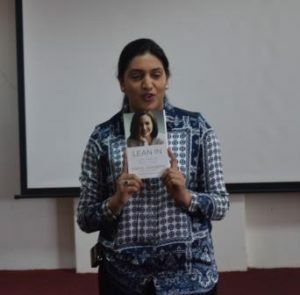 Ms. Resham Chordia, a young graduate from the University of Virginia and VP (Finance), Panchshil Realities, interacted with the students and shared with them her strong belief system that helped her scale enviable heights in business. 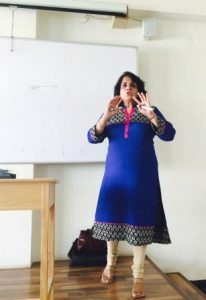 During her talk, she discussed the sad state of women where she told that a lot of work done by women in India is unpaid, and almost all of it is informal and unprotected. She strongly said that, Indian women are not well represented in many sectors, including business. She emphasized that we need to break the myth that women cannot engage in productive employment and instead, they should be encouraged to set up small and medium scale industries on their own initiative. 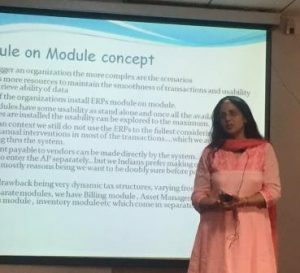 CA Shalini Jain, CFO, Express Clinics, was invited to speak on Accounting Procedures and ERP. Real time information and big data analysis is sine qua non for accuracy in decision making and therefore success in business and Ms. Jain explained how ERP aids in meeting this important business need. 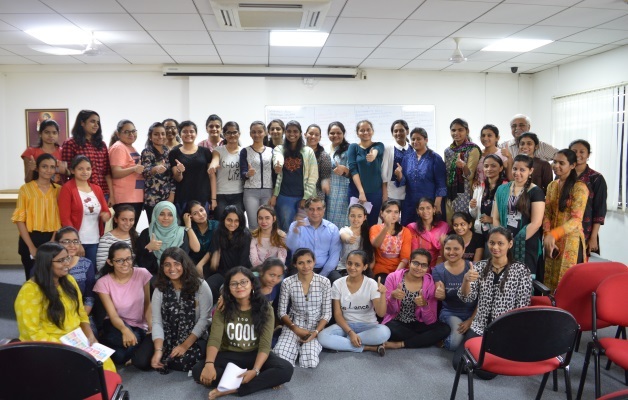 Mr. Ambulkar gave industry insights on recruitment, selection, person- job fit and performance management systems which reflected his experience of over 40 years in various organisations like Suzlon Energy,Sunflag Iron and Steel, Garware Nylon Ltd etc. 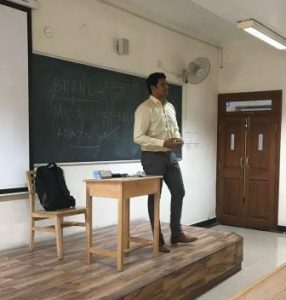 Mr. Dhiraj Baadkar of ND Consultants and Trainers conducted an informative session on the importance of personal Insurance and Financial Planning for the second year students. 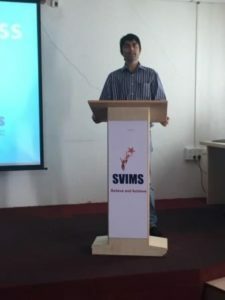 Mr Gaurav Gurbaxani, a young entrepreneur and the Director at Pragmites Consulting highlighted essentials of online advertising and also demonstrated how social media can be used as a powerful Marketing Tool. 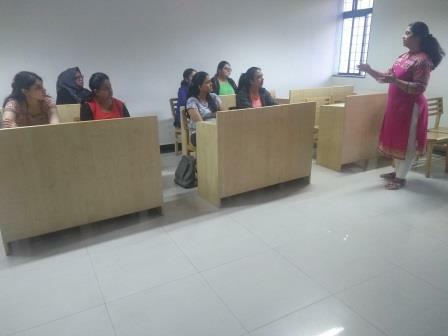 Captain Sanjivv Batish delivered a talk in our seminar hall, focusing on preparing women to take charge of their personal safety and to develop a strategy for safety in their daily life. He specifically chose this topic for discussion because, in his view, physical or mental violence against women is the result of power inequity and perceptions around gender roles. In a patriarchal country like India, gender roles, overt gender discrimination and devaluation of women is deeply rooted into our daily lives. He felt that, it is extremely important to identify and address this problem from a very young age and hence, bridging this gender disparity is the need of the hour.He further added that education or schooling is a process through which society creates the kind of individuals we wish to see in the world. Hence, role of school / college curriculum lays strong emphasis on inculcating values of equality, inclusivity and diversity, all of which are essential for building a healthy society. Use of the right aids and tools to defend oneself. Mr. Prasanta Choudhury, former President and MD, VIP Industries and Formica, presently Director and Partner in Renaissance Strategic Consultants Pvt. Ltd, and author of the best selling book Some Hits and Some Misses, visited SVIMS to interact with the students. His presentation was interlaced with the insights and experiences he had gained as a corporate executive for over forty years. Mr. Prakash Gurbaxani, Social Media Consultant, and Trainer, and CEO, Pragmites Internet Consulting spoke of the increasing use of social media which now stands as multi-way communication network for companies and customers and has overruled the old school marketing techniques of one way communication. He drew attention to the many individuals, teams and various organisations which have leveraged social media for their business. They have a definite competitive advantage over other organizations. Today in India, as many as 40 million people may be using online reviews to make purchase decisions. There are various business uses of social media such as establishing corporate/ personal brand, building trust, credibility & authority, developing network and building customer relationships. Ms. Kolhatkar from Atlas Copco, stated that brands touch every aspect of our lives, and we contribute to creating brand value at work and the workplace. The session included an inspiring video on Atlas Copco. The day long work shop gave students and faculty hands-on guidance to analyse financial statements. 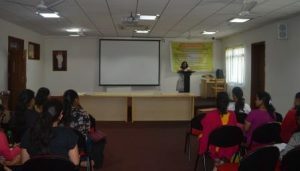 Ms. Vaishali Apte, the faculty for the workshop came from BSE Institute Ltd. It was a very interesting talk about the world of retail marketing and the interesting career opportunities it had to offer. Our visiting expert, Mr. Inder Moorjani, Senior Associate Consultant, Infosys explained to us how the whole concept evolved and also shared a few fascinating insights on consumer psychology with our students. 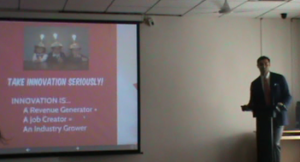 Mr. Rohit Sumant’s [DC Designs] talk revolved around the concept of satisfying customer’s needs and wants. Mr. Sumant also discussed the annual marketing plans of DC Designs, and how they use social media and on-ground activities to win their niche market. 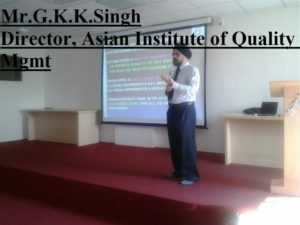 Mr. G.K. Singh, Director, Asian Institute of Quality Management spoke about Six Sigma and how it can achieve fast track growth for organizations and individuals. Lean six sigma benefits manufacturing and service business by process mapping and value analysis which in turn helps to reduce defects and wastage at all levels and in all functions. Mr.Singh explained how this new way of managing the organization and consistently improving its profitability can be achieved in spite of the growing competition and recessionary period. 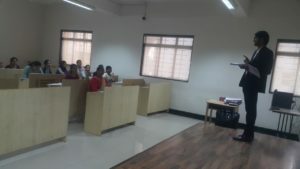 The seminar helped the students to understand the various sources from which equity reports can be prepared, which can be used for decision making at corporate levels. Mr. Barua also helped students to construct a hypothesis which is the foundation writing reports.